Living with a coffee enthusiast who regularly seeks out fine coffees from around the world, it never fails that he becomes a little bewildered at my occasional Starbucks visit. Call me a coffee sellout if you want but the reality is that they are super convenient, serve some pretty tasty pastries and have yummy frozen drinks that are very refreshing during the summer. I mean, look at how much fun you can have with a Frappuccino (just stop the video before the explosion part). The last time I was in there, I spied with my little chocolate-peanut butter seeking eyes, their adorable Peanut Butter Mini Cupcake. As you can see in the above photo, I didn’t get around to snapping a shot until it had been transported home in it’s mini box. I opened it to find it a bit smashed up, but still plenty adorable and most importantly: ready to be eaten. The frosting was perfectly creamed and substantially peanut buttery like I like it to be. The chocolate cupcake had a deep, rich cocoa flavor that went nicely with the frosting. See what I mean? Yummy stuff. Maybe if I bring him home a Rice Krispie Treat to distract him next time (they’re his favorite) the coffee enthusiast won’t shun me. 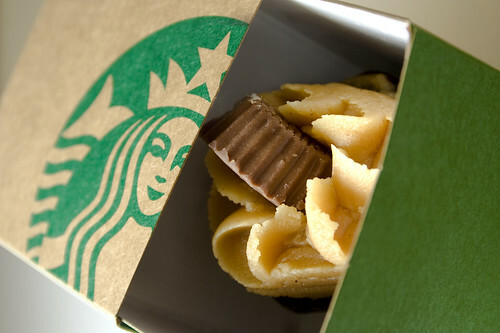 Get your fix at Starbucks. Just don’t play around in a gas station afterward. Eep.